Google has finally launched the Pixel 2 and Pixel 2 XL. And, as can be expected from the flagship phones of the Android maker, they appear to be fantastic. However, just as Android has to compete with iOS, the Pixel 2 has to compete with the iPhone. Here, we’re going to take a look at the biggest options from Apple and Google, the iPhone 8 Plus and Pixel 2 XL, and see how they stand up to each other. The Pixel 2 XL upgrades the design of the original Pixel XL to a small degree. It trims its bezels to increase the screen-to-body ratio of the phone’s front. It also squeezes two speakers above and below the screen for stereo audio. The iPhone 8 Plus, on the other hand, keeps the same old bezels as the previous generation of iPhones. It does have a stereo speaker setup, but not quite like the Pixel 2 XL, as one speaker is firing out of the bottom of the iPhone. Sadly, neither phone includes a 3.5mm headphone jack. There’s one camera on each side of the Pixel 2 XL, and the rear includes what Google claims is the fastest fingerprint sensor on a smartphone. The iPhone 8 Plus has a dual-lens setup on the back and a selfie snapper on the front. It also has its Touch ID fingerprint scanner built into the Home button on the front. Both phones have an IP67 rating against water and dust. So, they should have no problem with dust and splashes, and can be fully submerged for 30 minutes in about three feet of water. Both have strengthened screens, with the Pixel 2 XL using Gorilla Glass 5 and the iPhone 8 Plus using what Apple only described as its strongest smartphone glass yet. Both phones have metal bodies, though the Pixel 2 XL has a glass upper portion on the back. Interestingly, the two phones are roughly the same size. The iPhone 8 Plus measures 158.4 x 78.1 x 7.5mm, and the Pixel 2 XL is 157.9 x 76.7 x 7.9mm. Google’s device is a little lighter, coming in at 175g to the iPhone’s 202g. The iPhone 8 Plus offers a bit more in terms of color options, coming in Space Grey, Silver and Gold. Google’s device has comparatively less glamorous options, with just Black & White and Just Black. Which phone wins on design will more or less come down to personal taste. The Google Pixel 2 XL should easily take home the prize for best screen in its matchup with the iPhone 8 Plus. It’s not only larger, but also more pixel dense. The Pixel 2 XL features a 6-inch pOLED display with a resolution of 2,880 x 1,440 and pixel density of 538ppi. That’s super crisp, and has the unbeatable contrast ratio offered by OLED technology. The iPhone 8 Plus can’t compete with its 5.5-inch LCD display running at only 1,920 x 1,080. It’s True Tone technology may help it display images with accurate color, but it won’t look as nice as the larger, more pixel-dense OLED display on the Pixel 2 XL. Google tops it off with support for its virtual reality platform, Daydream. While there is a large degree of user preference involved here, Apple may win this category thanks to its sheer power. The iPhone 8 Plus runs iOS 11 on a hexa-core A11 Bionic chipset. It’s believed to run on 3GB of RAM, and iOS is known for using RAM extremely efficiently. The Pixel 2 XL runs Android 8.0 Oreo on an octa-core Snapdragon 835 chipset with 4GB of RAM. While we’ll have to wait and see how well the new Android operating system runs on the latest Snapdragon hardware, Apple’s impressive A11 performance looks hard to beat. Google Assistant is central on the Pixel 2 XL, and can help users complete tasks in a hurry. But, Apple has Siri to keep the competition lively. Both digital assistants will need testing to see which is more helpful in their latest forms, but Google Assistant is likely to have to edge thanks to Google’s efforts into AI and machine learning. Apple has always patted itself on the back for its incredible smartphone cameras, and it had every right to do so. Each iPhone has consistently offered one of the best smartphone cameras at the time of its launch. 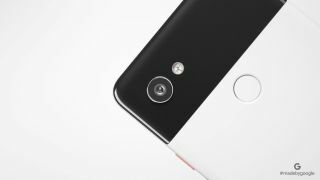 But, Google took it to another level by scoring the highest marks for a mobile phone camera from DxOMark with its first Pixel phones. The Pixel 2 XL scores even higher and sets a new record. The iPhone 8 Plus has a dual-lens set in back, with a 12MP wide-angle camera at f/1.8 and a 12MP telephoto camera at f/2.8. It lacks optical image stabilization for both cameras. On the front, a 7MP f/2.2 snapper is ready to take crisp selfies. Google only put one camera on the back of the Pixel 2 XL, but it’s a 12.2MP f/1.8 shooter with both optical and electronic image stabilization. Google’s Dual Pixel technology and AI-powered image recognition also let it selectively blur backgrounds in a special portrait mode akin to what dual-lens cameras do. The front-facing 8MP f/2.4 camera can also use that portrait mode. Both phones are capable of augmented reality. The two cameras will need to be tested against each other, but the record-setting DxOMark score seems to put the Pixel 2 XL above the iPhone 8 Plus. The Pixel 2 XL also looks like it’ll be winning the battery contest. It has a large 3,520mAh. It’s uncertain how big the iPhone 8 Plus battery is, but rumors place it at about 2,691mAh, putting Google ahead by about 25%. Just how long those batteries last in each phone will come down to how efficient they are, but with smartphone screens being the biggest battery hog, the Pixel 2 XL is likely to come out ahead thanks to its efficient OLED screen. Both phones have a base model that comes with 64GB of internal storage. The Pixel 2 XL starts at $849/AU$1,399, while the iPhone 8 Plus is $50/AU$170 cheaper at $799/AU$1,229. Since both phones are almost equally new, they’ll both likely be awhile in getting great discounts or deals. The Google Pixel 2 XL does come with a free Google Home Mini for a limited time, which would actually put the two phones on an even price point if the Google Home Mini price were subtracted from the total. The price of Google phone also comes with unlimited cloud storage for full-resolution photos and videos taken on the device, whereas Apple has limits to its cloud storage. It’s not as simple a matter to compare an iPhone and an Android phone as it is to compare two Android phones. With such different operating systems and chipsets, it’s impossible to say which device is going to offer a better user experience this early on. On paper, the iPhone 8 Plus and Pixel 2 XL have a lot of close races. The screen and stereo speakers put the Pixel 2 XL a ways ahead for media consumption, but ample testing will be required to decide which really is the king of smartphone cameras. Even if the Google Pixel 2 XL comes ahead slightly in a lot of matchups, the iPhone 8 Plus is still $50/$AU170 cheaper. We’ll continue to update as testing helps us determine which phone wins out in each category.